The founders (the “Board”) have identified an opportunity to list a medicinal cannabis focused investment company, Ananda Developments plc (“Ananda” or the “Company”) on the NEX Exchange (“NEX”). Ananda is seeking to raise £750,000 at 0.45p per share, as part of its Initial Public Offering (“IPO”) on NEX. The market cap of Ananda at IPO will be £1.3m, based on the Company raising the full £750,000. Funds raised pursuant to the IPO will be used for the assessment and acquisition of projects and/or companies in line with the investment strategy above and for general working capital purposes. 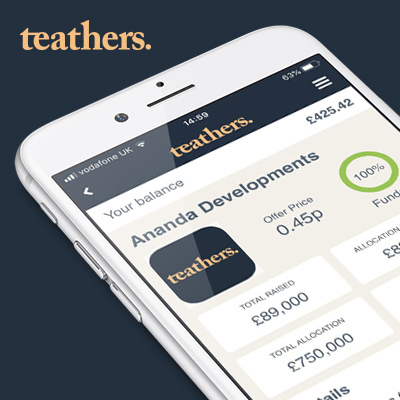 Onboarded users of the Teathers App may subscribe for ordinary shares in Ananda at 0.45p per share (the “Deal”). Any subscription for shares in Ananda via the Teathers App may be subject to scale back. Dealing is expected to commence in Ananda’s shares on Wednesday 27 June, when the Company is expected to complete its IPO. Settlement of the Deal is expected to occur on Wednesday 27 June. Contract notes will be issued on settlement and completion of the Deal. The Deal will open on the Teathers App at 12pm on Friday 08 June and will close at 1700 on Monday 18 June. Once listed the Board will utilise its extensive collective networks within the medicinal cannabis sector to identify and assess projects, businesses and other opportunities that could be acquired, or invested in. The Directors believe the NEX Exchange listing of Ananda offers an attractive platform for UK investors to gain exposure to the growing market for medicinal cannabis. Up until now there has been a lack of medicinal cannabis investing opportunities for UK investors. The market for products which are based on or contain Cannabis derived cannabinoids is growing strongly due to the increased awareness of the benefits of cannabinoids to various aspects of health and because they are now legal in an increasing number of countries around the world and states in the USA. Ananda’s investment strategy is to invest in companies, projects or products that are either progressing medicinal/therapeutic Cannabis research and development or are developing, or have already developed, products and require funding to progress work plans or commercialise products. Ananda will look to invest in companies and projects in Canada, the Netherlands and Israel. Other countries will be considered if suitable projects arise. The Directors will consider the acquisition of a business or businesses that could be classed as a Reverse Takeover (RTO). The Company intends to be an active investor in situations where the Company can make a clear contribution to the progress and development of the investment. In more substantial investment opportunities, the Directors expect that the Company will be a passive investor. Melissa Sturgess – Executive Director Melissa has over 20 years’ experience in capital markets on both the Australian and AIM Market of the London Stock Exchange. After a long career involved in the acquisition and listing of African metals and mining projects Melissa moved into the corporate restructuring of UK listed entities and the identification and acquisition of businesses in a range of sectors. She was the key driver in the recapitalisation of Messaging International plc in 2016 and of URA Holdings plc in 2017. Melissa holds a BSc and an MBA from The University of Western Australia. Charles W. Morgan – Executive Director Charles Morgan is a resources and technology venture capitalist who has identified emerging sectors and acquired early stage and strategic positions in a wide range of ventures around the globe. Mr Morgan began his career in futures broking in London in 1980 and worked for UK and Australian Investment Banks before founding his own securities firm with a partner and then listed his first company on the ASX in 1997. He has since been involved in numerous listed companies as founder and or director. John Treacy – Non-Executive Director John Treacy is a London-based experienced small cap financier who specialises in working with growing companies. He qualified as a solicitor in the London office of a major international law firm where he specialised in Capital Markets and Mergers & Acquisitions. From there he moved to practice corporate finance in the advisory teams of several prominent UK brokerages where he acted as an adviser to a number of AIM companies and advised on numerous IPOs, acquisitions, debt restructurings and placings. Dr Inbar Maymon Pomeranchik – proposed NED Dr Pomeranchik holds a PhD in plant sciences molecular biology from the Hebrew University of Jerusalem and a multi- disciplinary post-doctorate from Weizmann Institute, combining drug biochemistry with plant science. After more than 10 years as a researcher in diverse industries in small start-ups and large corporations, Dr Pomeranchik founded Biodiligence Limited, a private company, providing techno-economic analysis and consultancy services in the field of biotechnology, agricultural technology within the Medicinal Cannabis space for venture capitalists, private equity investors and family offices. Dr Eli Schmell – Senior Advisor Dr Schmell holds a BSc in Mathematics and Physics from the City University of New York; a PhD in Cellular and Molecular Biology from the Johns Hopkins University School of Medicine. He was a Senior Staff Fellow at the National Institute of Child Health at the National Institute of Health and post-doctoral fellowship at the John Hopkins University. Dr Schmell has over thirty years of direct, global and senior management experience in all aspects of the BioPharma/Biotechnology industry. In recent years, he has been active in the emerging Medical Cannabis industry, where his background in BioPharma drug development and registration is directly applicable. In addition to all other information set out in this Document, the following specific factors should be considered carefully in evaluating whether to make an investment in the Company. If you are in any doubt about the action you should take, you should consult a professional adviser authorised under FSMA who specialises in advising on the acquisition of shares and other securities prior to making any investment. If any of the following risks were to materialise, the Company’s business, financial conditions, results or future operations could be materially adversely affected. Additional risks and uncertainties not presently known to the Directors, or which the Directors currently deem immaterial, may also have an adverse effect upon the Company. In that case, the market price of the Ordinary Shares could decline and all or part of an investment in the Ordinary Shares could be lost. There can be no certainty that the Company will be able to implement successfully the investment strategy set out in this Document. In particular, the Company’s performance and its investments are likely to be affected by changes in market and/or economic conditions, political, judicial, and administrative factors and in legal, accounting, regulatory and tax requirements in the areas in which it invests. There may be additional risks and uncertainties that the Directors do not currently consider to be material or of which they are currently unaware which may also have an adverse effect on the Company. The list below is not exhaustive, nor is it an explanation of all the risk factors involved in investing in the Company and nor are the risks set out in any order of priority. the Company may need to raise further capital to make investments and/or fund the assets or businesses invested in, all of which may in turn have a material adverse effect on the business, financial condition, results of operations and prospects of the Company. The Company cannot accurately predict how long it will take to deploy the capital available to it or at all. Precise timing will depend on, amongst other things, the availability of suitable direct investments, due diligence, negotiations with counterparties and investment structuring conditions. Competition The Company may face significant competition in identifying and acquiring suitable investments from other investors, including competitors who may have greater resources. Competition in the investment market may lead to prices for investments, identified by the Company as suitable, being driven up through competing bids of potential purchasers. Accordingly, the existence and extent of such competition may have a material adverse effect on the Company’s ability to acquire investments at satisfactory prices and otherwise on satisfactory terms, thereby reducing the Company’s potential profits. Article 50 Withdrawal The UK, as a member of the European Union, has triggered Article 50 to commence the UK’s withdrawal from the European Union. Therefore, any plans of the Company to invest in the European Union will have to be considered in line with such withdrawal and the consequences of making investments as a result. Success of the strategy not guaranteed The Company’s level of profit on its investments will be reliant upon the performance of the assets acquired and the market for those assets. The strategy, in both its current form and as amended from time to time, is not guaranteed to succeed. The success of the strategy depends on the Directors’ ability to identify investments in accordance with the Company’s investment objectives and for those investments to perform positively. No assurance can be given that the strategy to be followed will be successful under all or any market conditions, that the Company will be able to identify opportunities meeting the Company’s investment criteria, that the Company will be able to invest its capital on attractive terms or that the Company will be able to generate positive returns for Shareholders. If the strategy is not successfully implemented, this may have a material adverse effect on the business, financial condition, results of operations and prospects of the Company. Dependence on Management The Company’s ability to provide returns to Shareholders and achieve its investment objective is dependent on the performance of the Directors and its investment advisers in the identification, technical assessment, acquisition, management and disposal of investments in various target companies and projects. Failure by the Directors and its investment advisers in this regard could have a material adverse effect on the Company’s business, financial condition and return on investments. the possibility of the imposition of withholding or other taxes on dividends, interest, capital gains or other income, limitations on the removal of funds or other assets of the Company, political changes, government regulation, social instability or diplomatic developments (including war) which could adversely affect the economies of such countries or the value of the Company’s investments in those countries. There can be no assurance that any market for the Company’s investment strategy will develop in such foreign jurisdiction. The Company may face new or unexpected risks or significantly increase its exposure to one or more existing risk factors, including economic instability and the effects of competition, some of those are mentioned above. These factors may limit the Company’s capability to successfully expand its investment strategy and may have a material adverse effect on the Company’s business, financial condition and return on investments. Restrictions on foreign investment Some countries prohibit or impose substantial restrictions on investments by foreign entities such as the Company. As illustrations, certain countries require governmental approval prior to investment by foreign persons or limit the amount of investment by foreign persons in a particular company, or limit the investment by foreign persons in a company to only a specific class of securities which may have less advantageous terms than securities of the company available for purchase by nationals. Certain countries may restrict investment opportunities in issuers or industries deemed important to national interests. The manner in which foreign investors may invest in companies in certain countries, as well as limitations on such investments, may have an adverse impact on the operations of the Company. For example, the Company may be required in certain of such countries to invest initially through a local broker or other entity and then have the share purchases re-registered in the name of the Company. Re- registration may in some instances not be able to occur on a timely basis, resulting in a delay during which the Company may be denied certain of its rights as an investor, including rights as to dividends or to be made aware of certain corporate actions. There also may be instances where the Company places a purchase order but is subsequently informed, at the time of re-registration, that the permissible allocation to foreign investors has been filled, depriving the Company of the ability to make its desired investment at the time. Substantial limitations may exist in certain countries with respect to the Company’s ability to repatriate investment income, capital or the proceeds of sales of securities by foreign investors. The Company could be adversely affected by delays in, or a refusal to grant any required governmental approval for repatriation of capital, as well as by the application to the Company of any restriction on investments. 4. Risks relating to the investment in target companies whose main activities include Cannabis production and research and development thereof The Company’s reputation may be damaged Damage to the Company’s reputation can be the result of the actual or perceived occurrence of any number of events, and could include negative publicity, whether true or not. This may arise as a consequence of investing in the production and the research and development of Medicinal Cannabis, Cannabis being a Class B drug within the UK. The increased usage of social media and other web-based tools used to generate, publish and discuss user-generated content and to connect with other users has made it increasingly easier for individuals and groups to communicate and share opinions and views with regard to the Company and its activities, along with those activities of certain target companies in which the Company invests. Reputation loss may result in decreased investor confidence, increased challenges in developing and maintaining community relations, banking relationships etc. and thereby having a material adverse impact on the financial performance, financial conditions, cash flows and growth prospects of the Company. The Company and its shareholders may be at risk of committing offences under POCA 2002 Even with the Company taking all precautions to ensure that it and the target companies in which it invests comply fully with all applicable regulations and legislation in relation to Cannabis (both in the UK and in the relevant foreign jurisdiction applicable to a target company), there are no guarantees that the activities of the Company and a target company will always be deemed lawful if there are any changes in the applicable law. The Company will take all precautions possible to ensure that it does not at any time contravene POCA 2002. Contravention of POCA 2002 carries potential criminal liability. The Company’s reputation may be damaged Damage to the Company’s reputation can be the result of the actual or perceived occurrence of any number of events, and could include negative publicity, whether true or not. This may arise as a consequence of investing in the production and the research and development of Medicinal Cannabis, Cannabis being a Class B drug within the UK. The increased usage of social media and other web-based tools used to generate, publish and discuss user-generated content and to connect with other users has made it increasingly easier for individuals and groups to communicate and share opinions and views with regard to the Company and its activities, along with those activities of certain target companies in which the Company invests. Reputation loss may result in decreased investor confidence, increased challenges in developing and maintaining community relations, banking relationships etc. and thereby having a material adverse impact on the financial performance, financial conditions, cash flows and growth prospects of the Company. The Company, or the Medicinal Cannabis industry more generally, may receive unfavourable publicity or become subject to negative consumer perception The Company believes that the Medicinal Cannabis industry is highly dependent upon consumer perception regarding the medical benefits, safety, efficacy and quality of the Cannabis distributed for medical purposes to such consumers. Consumer perception of a target company’s products can be significantly influenced by scientific research or findings, regulatory investigations, litigation, political statements, media attention and other publicity (whether or not accurate or with merit) regarding the consumption of Cannabis products for medical purposes, including unexpected safety or efficacy concerns arising with respect to the products of a target company or its competitors. There can be no assurance that future scientific research, findings, regulatory proceedings, litigation, media attention or other research findings or publicity will be favourable to the Medicinal Cannabis market or any particular product, or consistent with earlier publicity. Future research reports, findings, regulatory proceedings, litigation, media attention or other publicity that are perceived as less favourable than, or that question, earlier research reports, findings or publicity could have a material adverse effect on the demand for a target company’s products and the business, results of operations and financial condition of a target company and therefore materially adversely affect the Company’s return on investment. Furthermore, adverse publicity reports or other media attention regarding the safety, efficacy and quality of Cannabis for medical purposes in general, or a target company’s products specifically, or associating the consumption of Cannabis with illness or other negative effects or events, could have such a material adverse effect. Such adverse publicity reports or other media attention could arise even if the adverse effects associated with such products resulted from consumers’ failure to consume such products legally, appropriately or as directed. Cannabis plant may not be approved for medicinal use in all (or any) jurisdictions Medical regulatory authorities in many jurisdictions require carefully conducted studies (clinical trials) in hundreds to thousands of human subjects to determine the benefits and risks of a possible medication. In many jurisdictions, researchers have not conducted sufficient large-scale clinical trials that show that the benefits of the Cannabis plant (as opposed to its cannabinoid ingredients) outweigh its risks in patients it’s meant to treat. Further clinical research studies on the effects of Medicinal Cannabis may lead to conclusions that dispute or conflict with the Company’s (and target companies’) understanding and belief regarding the medical benefits, viability, safety, efficacy, dosing and social acceptance of Cannabis Research in Canada, the US and internationally regarding the medical benefits, viability, safety, efficacy, dosing and social acceptance of Cannabis or isolate cannabinoids (such as CBD and THC) remains in early stages. The statements made in this Document concerning the potential medical benefits of cannabinoids are based on published articles and reports. As a result, the statements made in this Document are subject to experimental parameters, qualifications and limitations in the studies that have been completed. Although the Company believes that the articles, reports and studies referenced in this Document support its belief regarding the medical benefits, viability, safety, efficacy, dosing and social acceptance of Cannabis as set out in this Document, future research and clinical trials may prove such statements to be incorrect, or could raise concerns regarding, and perceptions relating to, Cannabis. Given these risks, uncertainties and assumptions, prospective investors should not place undue reliance on such articles and reports. Future research studies and clinical trials may draw opposing conclusions to those stated in this Document or reach negative conclusions regarding the medical benefits, viability, safety, efficacy, dosing, social acceptance or other facts and perceptions relating to Medicinal Cannabis, which could have a material adverse effect on the demand for target company products with the potential to lead to a material adverse effect on a target company’s business, financial condition and results of operations, and as such, materially adversely affect the Company’s return on investment. 5. Risks relating to regulatory matters Laws, regulations and guidelines may change in ways that the Company has not predicted The laws, regulations and guidelines applicable to the Medical Cannabis industry may change in ways currently unforeseen by the Company. The Company’s ability to invest into approved and properly licensed companies lawfully producing and/or conducting research into Cannabis are subject to laws, regulations and guidelines of the United Kingdom as well as the jurisdictions in which it is invested. If there are any changes to such laws, regulations or guidelines occur, which are matters beyond the Company’s control, the Company may incur significant costs in complying with or is unable to comply with such changes. This may have a material adverse effect on the Company’s business, financial condition and results. Regulatory Compliance Risks and maintaining a bank account Failure to comply with regulations may result in additional costs for corrective measures, penalties or in restrictions of operations. In addition, changes in regulations, more vigorous enforcement thereof or other unanticipated events could require extensive changes to operations, increased compliance costs or give rise to material liabilities, which could have a material adverse effect on the business, results of operations and financial condition, and, therefore, on the Company’s prospective returns. As a result of perceived reputational risk and regulatory risks, the Company, in the Medicinal Cannabis sector, may in the future have difficulty in maintaining its current bank accounts, establishing further bank accounts, or other business relationships. Environmental Regulations and Risks The operations of some target companies will be subject to environmental regulation in the various jurisdictions in which they operate. These regulations mandate, among other things, the maintenance of air and water quality standards and land reclamation. They also set forth limitations on the generation, transportation, storage and disposal of solid and hazardous waste. Environmental legislation is evolving in a manner which will require stricter standards and enforcement, increased fines and penalties for non- compliance, more stringent environmental assessments of proposed projects and a heightened degree of responsibility for companies and their officers, directors and employees. There is no assurance that future changes in environmental regulation, if any, will not adversely affect the business, financial condition and operating results of a target company, and therefore have a material adverse effect on the on a target company, and therefore have a material adverse effect on the Company’s return on investment. 6. Risks relating to the Ordinary Shares No prior market There has been no prior public market in the Ordinary Shares, so the trading price of the Ordinary Shares is likely to be volatile, and investors might not be able to sell their Ordinary Shares at or above the Subscription Price or may not be able to sell them at all. The Subscription Price may not be indicative of the market price of the Ordinary Shares after Admission and therefore the market price of the Ordinary Shares after Admission may be significantly different from the Subscription Price. As a result of these and other factors, investors may be unable to resell their Ordinary Shares at or above the Subscription Price. Further issues of Ordinary Shares It may be desirable for the Company to raise additional capital by way of further issues of Ordinary Shares to enable the Company to progress through further stages of development. Any additional equity financing may be dilutive to Shareholders. There can be no assurance that such funding, if required, will be available to the Company. Acceptability of Ordinary Shares as consideration Although it is the Company’s intention, where appropriate, to use Ordinary Shares to satisfy all or part of any consideration payable for investments, vendors may not be prepared to accept these shares. Secondary fundraisings Once the first investment opportunity is identified, the Company will likely be required to seek further equity financing. There can be no guarantee that the Company will be successful in future rounds of fundraising. Such failure to secure further financing may result in the Company abandoning its Investment Policy. 7. Risks relating to financial matters Borrowings The Company may, from time to time, be required to raise capital (whether through the issue of debt or equity) to make investments. There is no guarantee that the Company will be able to obtain financing on appropriate terms and conditions or at all. The companies in which the Company invests may also have borrowings or otherwise be geared or leveraged. Although such facilities may increase investment returns, they also create greater potential for loss. This includes the risk that the borrower will be unable to service the interest repayments, or comply with other requirements, rendering the debt repayable, and the risk that available capital will be insufficient to meet any such required repayments. There is also the risk that existing borrowings will not be able to be refinanced or that the terms of such refinancing will not be as favourable as the terms of existing borrowings. A number of factors (including changes in interest rates, conditions in the banking market and general economic conditions, which are beyond the Company’s control) may make it difficult for the Company to obtain new financing on attractive terms or even at all. An inability to obtain such facilities may have a material adverse effect on the business, financial condition, results of operations and prospects of the Company. Tax risks The Company may purchase investments that will subject the Company to withholding taxes in various jurisdictions. In the event that withholding taxes are imposed with respect to any of the Company’s investments, the effect will generally be to reduce the income received by the Company on such investments. Such withholding taxes may be imposed on income, gains, issue of securities or supporting documents, including the contracts governing the terms of any financial instrument and such taxes may be confiscatory in nature. The Company shall be making investments in jurisdictions where the tax regime is not fully developed or is not certain. There can be no certainty that the current taxation regime in England and Wales or in other jurisdictions within which the Company may operate will remain in force or that the current levels of corporation taxation will remain unchanged. Any change in the tax status or tax legislation may have a material adverse effect on the financial position of the Company. The Company’s income may be reduced by exchange controls The Company may purchase investments that will subject the Company to exchange controls in various jurisdictions. In the event that exchange controls are imposed with respect to any of the Company’s investments, the effect will generally be to reduce the income received by the Company on such investments. Currency and foreign exchange risks The Company’s business will be carried out in currencies other than sterling. To the extent that there are fluctuations in exchange rates, this may have an impact on the figures consolidated in the Company’s accounts, which could have a material impact on the Company’s financial position or result of operations, as shown in the Company’s accounts going forward. The Company does not currently undertake foreign currency hedging transactions to mitigate potential foreign currency exposure but may do so in future. The Board cannot predict the effect of exchange rate fluctuations upon future operating results and there can be no assurance that exchange rate fluctuations will not have a material adverse effect on the business, operating results or financial condition of the Company. 8. Risks Relating to trading on the NEX Exchange Growth Market Investment in unlisted securities Investment in shares traded on the NEX Exchange Growth Market is perceived to involve a higher degree of risk and be less liquid than investment in companies whose shares are listed on the Official List or AIM. An investment in Ordinary Shares may be difficult to realise. Prospective investors should be aware that the value of the Ordinary Shares may go down as well as up and that the market price of the Ordinary Shares may not reflect the underlying value of the Company. Investors may therefore realise less than, or lose all of, their investment. Suitability An investment in the Ordinary Shares may not be suitable for all recipients of this Document. Investors are accordingly advised to consult an appropriate person authorised under FSMA, or its equivalent in another jurisdiction, before making their decision. Share price volatility and liquidity The share price of early stage public companies can be highly volatile and shareholdings illiquid. The price at which the Ordinary Shares are traded and the price which investors may realise for their Ordinary Shares will be influenced by a large number of factors, some specific to the Company and its operations and some which may affect quoted companies generally. These factors could include the performance of the Company, large purchases or sales of the Ordinary Shares, legislative changes and general economic, political or regulatory conditions. Market risks Notwithstanding the fact that an application has been made for the Ordinary Shares to be traded on the NEX Exchange Growth Market, this should not be taken as implying that there will be a “liquid” market in the Ordinary Shares. Continued admission to the NEX Exchange Growth Market is entirely at the discretion of NEX Exchange. If the Company has not substantially implemented its investment strategy within two years of Admission, trading in the Ordinary Shares will be suspended pursuant to the NEX Exchange Rules. There can be no guarantee that trading in the Ordinary Shares will re-commence if such suspension occurs. Any changes to the regulatory environment, in particular the NEX Exchange Rules could, for example, affect the ability of the Company to maintain a trading facility on the NEX Exchange Growth Market. The investment opportunity offered in this Document may not be suitable for all recipients of this Document. Investors are therefore strongly recommended to consult a professional adviser authorised under FSMA, who specialises in investments of this nature, before making their decision to invest.